When a director hires Jason Statham for a film, he or she is making a statement about that film. The same could be said when a director hires Clive Owen, too. In hiring both Jason Statham AND Clive Owen, Gary McKendry is making that statement as loud as he possibly can, and making it to a British audience. For those who did come along for the action, it doesn't disappoint. There are plenty of high-octane scenes of fistfights and fiery explosions. 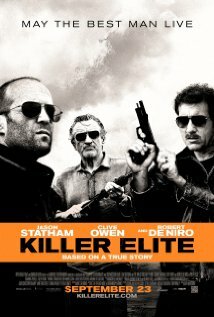 Killer Elite opens with an action sequence, as 'Hunter' (Robert De Niro) is kidnapped and held by a villainous Arabian Sheik. What's interesting here is that I feel McKendry has used Robert De Niro in the same way Tom Hanks was used in Apollo 13. I didn't buy Tom Hanks as an Astronaut, but my stars I wanted Tom Hanks to get back safely to Earth. Similarly, Robert De Niro, although not without action credentials, just doesn't do it as a career elite forces guy (a mistake made in the production of the 1998 failure Ronin), however when we see him imprisoned by a murder-hungry Arabian Sheik, I do want to bust him out of there. It was largely shot in Australia, and there is a sequence in a subway system which is actually Melbourne's own Parliament station (edited after shooting to look like the Paris metro), so Melbourne readers, keep an eye out for that. I have a problem with the use of women in Killer Elite. There is only one female character who goes through the film without getting her top off: Danny's (Jason Statham) love interest. How are we to feel about that? Can respectability and audience sympathy be earned by women so easily that all need be done is to keep the clothes on? My next problem is with just how generic and basic everything seems to be. Anything plot-relevant is undermined by just how generic it is. There's a realism and credibility which comes from a little bit of specificity, and McKendry does everything in his power to avoid it. The lack of anything specific is so complete, that about 45 minutes in I couldn't answer a question I asked myself: 'what is this film about?' If you come across anyone who has seen this film, give yourself a laugh and ask that person what it's about, really, it's about nothing more than people who kill, and are elite at it, who are trying to kill each other. No MacGuffins, no background, just killers killing. The film has the budget and supporting cast it needs to give it more substance, but instead it's pure exploitation for a crowd who'll front up to see a Jason Statham movie. It will work for that audience, but not many more. Reviewing my own principles for the star rating system, there's no choice other than one-and-a-half. It's a film which sets out with a specific purpose and barely achieves that, but nothing else. The atmosphere and characterization of the elite British SAS gives the film a good tone for the explosions and shouting and punching, but there is a distinct lack of character development, and nothing makes the lack of character or character development more obvious than when we're given a rather cynical and crass going-through-the-motions attempt thereat come the film's conclusion. Where we need some character twist or some depth, we get pointless smarm. If you thought Stallone's The Expendables was 'epic', you'll get into Killer Elite, otherwise, you probably oughtn't bother.